Plug-in Hybrid Truck Powered by BorgWarner's Electric Motor - BorgWarner Inc.
AUBURN HILLS, Mich., Feb. 20, 2019 /PRNewswire/ -- BorgWarner's reputation as a leading supplier of hybrid vehicle systems was further strengthened by the news that a major European commercial vehicle manufacturer has chosen the company's proven High Voltage Hairpin (HVH) 410 electric motor for a plug-in hybrid electric truck (PHEV) to be launched in 2019. The electric motor is a key component in a range of vehicles including urban and night-time delivery trucks and waste handling vehicles. Generating 130 kW (174 hp) of power and 1,050 Nm of torque, the HVH motor will work in parallel with an inline five-cylinder engine that runs on hydro treated vegetable oil (HVO) or diesel. The HVH motor will also regeneratively charge the battery pack during braking or downhill coasting. "We are excited that our powerful and durable electric motor has been chosen for this important plug-in hybrid application, which will be a game-changer in the field of urban distribution trucks and night-time deliveries," said Dr. Stefan Demmerle, President and General Manager, BorgWarner PowerDrive Systems. "It follows the use of our HVH410 technology on citywide hybrid buses, reinforcing our position as a global leader in technologies that help vehicle manufacturers meet emerging market demands and operate in zero-emissions zones as well as noise sensitive areas." 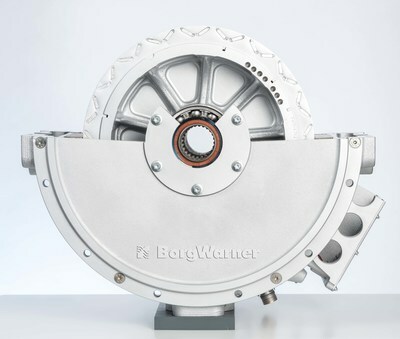 BorgWarner's HVH410 electric motors are available as fully housed motors or as rotor/stator assemblies. Instead of conventional round wire windings, they use precision-formed rectangular wires and multiple layers of interlocking "hairpins". The patented high-voltage (650 volt) HVH technology enables the versatile and powerful electric motors to deliver a maximum torque of 2,000 Nm and a power output of up to 300 kW (402 hp) with peak efficiencies exceeding 95 percent. Featuring compact dimensions and individually customizable stack length, BorgWarner HVH electric motors provide tailor-made solutions for the specific requirements of customers. Cooling and winding configurations allow easy integration into almost all electric and hybrid applications.